Not to be outdone by the mass of twitching successes birders have been enjoying around Britain these past few days I thought it was high time I joined in yesterday afternoon. I don't often twitch birds outside of Surrey but Burpham in West Sussex is not much further for me to travel than the far reaches of western Surrey. A Pallid Harrier was the bird on show - hopefully. I was on the usual tight schedule, but the plan was to belt down the M23 and the A23 towards Brighton and then head west along the A27 past Worthing and Littlehampton before heading north again to the village of Burpham. I made it in record time (abiding to all the speed limits along the way, obviously) and, taking notice of the request on the Sussex Ornithological Society website, I diligently parked at the George and Dragon pub. A lady dog-walker very kindly gave me directions to Peppering Lane - she had seen plenty of photographers on the top of the hill (aka birders), and I set off on the half-mile walk. A Haslemere birder generously stopped and gave me a lift part of the way, and it was abundantly clear that no-one had taken any notice of the parking request as they had all parked on the lane with a view across valley where the Harrier was often seen. This particular site is apparently one of the best in the south-east for raptors - a proverbial 'Raptor Alley'. 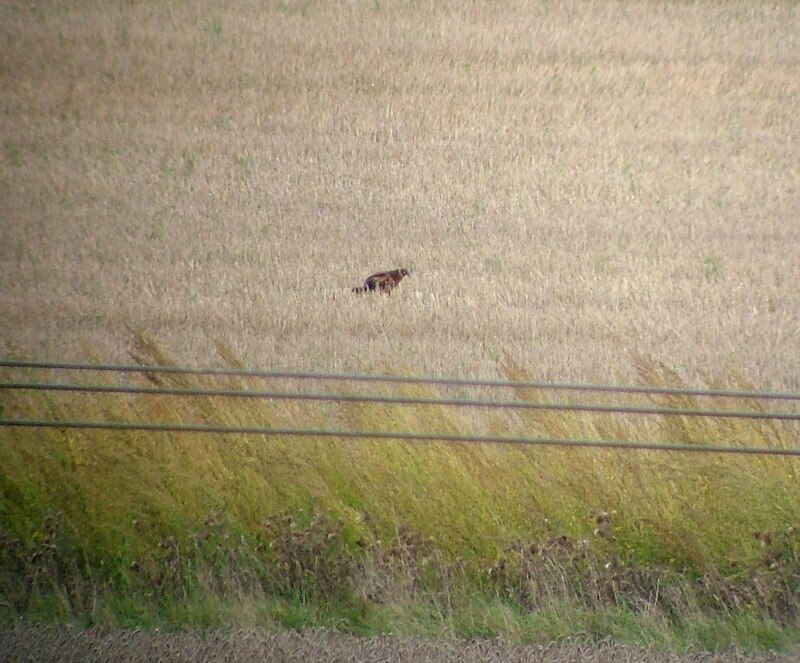 One birder was reported to have seen ten different species of raptor on Saturday alone. It wasn't difficult to work out why it is so popular with birds of prey. Plenty of rich arable farm land, rolling hillsides, untouched hedgerows. 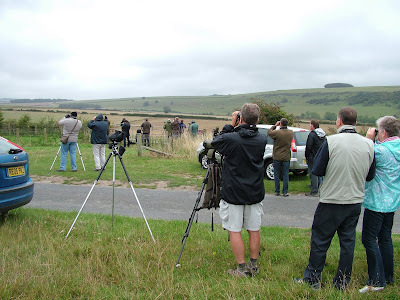 There were plenty of birders gazing across the valley. 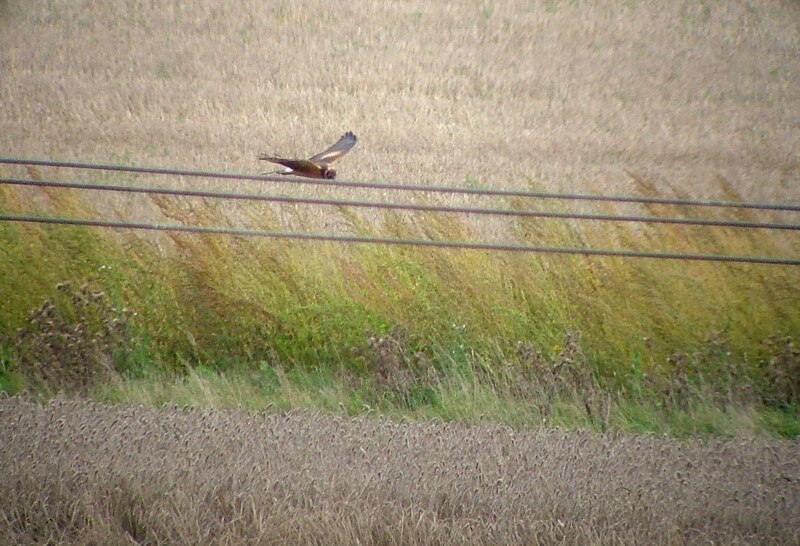 Apparently the Harrier had been seen about ten minutes before I arrived (usual story). 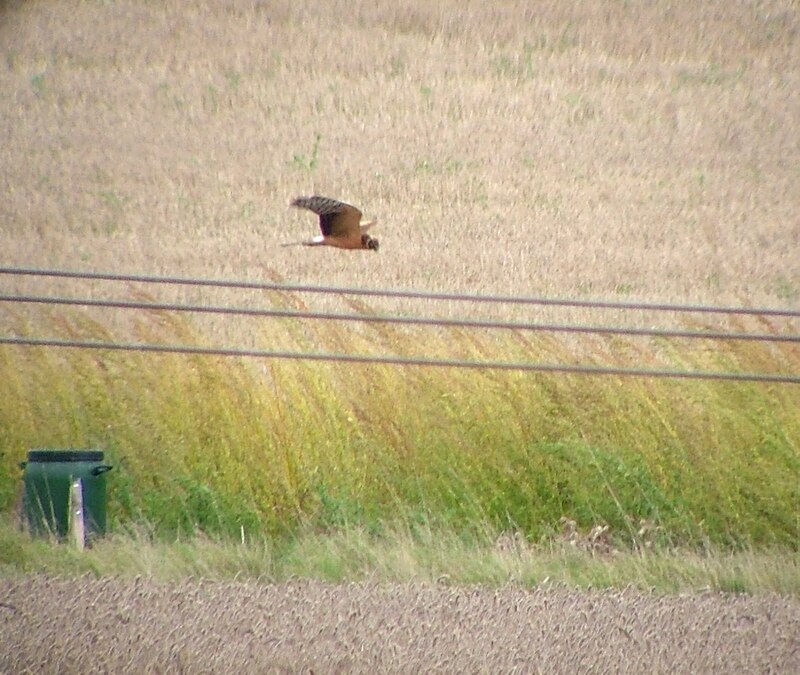 I spoke to top Sussex birder Bernie Forbes, who explained that the Pallid Harrier would often quarter along the fields in the valley and do a loop around the area. We waited an age for something to happen. Plenty of Common Buzzards were hovering and gliding along the fields in the brisk wind, including a very pale morph juvenile that got everyone excited momentarily. While we waited for the star attraction to make an appearance I saw a Hobby chased by a couple of Jackdaws across the ridge, a Peregrine flying south, and a Kestrel. After nearly two hours I was debating whether to return the next morning, when someone spotted the rare raptor. 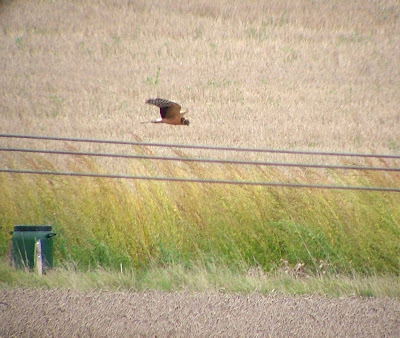 It took a while to locate, but the juvenile PALLID HARRIER was heading west, on the other side of Peppering High Barn - and then we lost sight of it. As is often the case on twitches, so I've discovered, this was a cue for a number birders to scuttle off like lemmings in the direction of the farm. A number of us stayed put. There was little point, I thought, of chasing after the bird if it could end up flying back towards our original viewpoint. It was evident the Harrier could turn up anywhere, and so it proved. After waiting for a further 30 minutes, a bloke arrived having walked up from the village end of Peppering Lane and told everyone within ear shot that the bird was in fact down in the valley to the south of us, perched in a tree in a field very close to the lane. We looked down and there it was, having taken to the air again. Somehow the Pallid Harrier had flown low through the valley without anyone seeing it and had given those birders who were down in that area brilliant views. 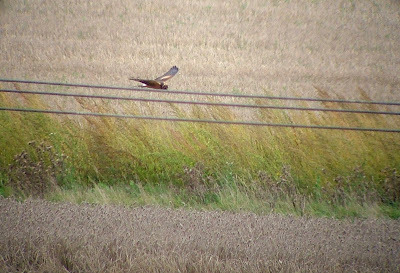 After another Hobby flew overhead, this time it was me who was scuttling off down the lane. Glad I did though, because when I got to the bottom of the hill I could see it was on the deck in the field eating a catch. After a few minutes it was in the air again, being mobbed by a couple of crows. 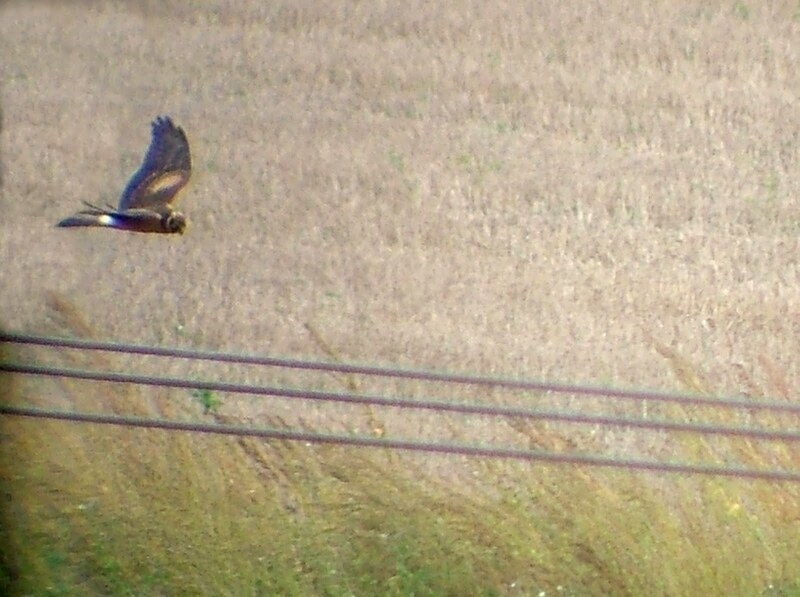 Once the corvids cleared off, however, we were treated to this fantastic Pallid Harrier quartering majestically in front of us - into the wind, up and down the edge of the field. What a beautiful bird. It's striking facial markings for some reason remind me of the masks worn by the lucha libre Mexican wrestlers. Eventually, it drifted further to the east, climbing higher before spotting something further to eat. 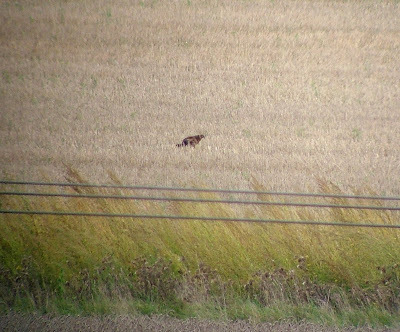 It then tucked its wings back and dropped towards the field, behind a hedgerow, and its prey. It was likely to spent a fair while tucking into its second meal of the afternoon, so that seemed a good time to head home. This Pallid Harrier was a landmark bird for me, being the 200th British bird I have seen during the past three years I have been birding fairly seriously. It's not much of a list compared to other people, I admit - more than three-quarters of these are from Surrey, but as I mentioned earlier I'm not much of a twitcher outside of the county. There are stacks of relatively common birds I have yet to see - I won't mention what they are! 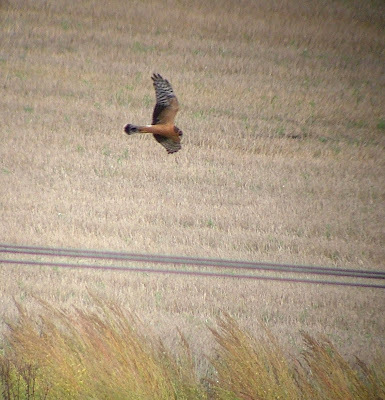 Suffice to say I have plenty of enjoyable discoveries, like the magnificent Pallid Harrier, to look forward to. A lovely bird indeed. I dipped the one in Essex on Sunday, and managed to see this one today.